This was a print-out pattern that you print off on multiple pages, tape together, and cut out. The process was tedious, and I would much rather buy a traditional pattern. 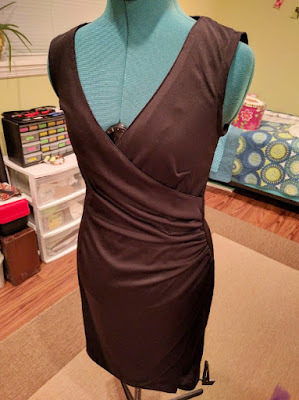 I would not recommend Burda Style patterns because the instructions are brief and confusing to read. I thought it might just be this particular pattern, but I purchased a second pattern with instructions that were also incredibly brief and poorly written. I ended up throwing out the instructions and completing this dress how I imagined it was supposed to be put together. So, if you need instructions, don't get a pattern from Burda Style. If you can figure out how pieces should go together and in what order yourself, I still wouldn't recommend using them because it seems over priced for what you get. They don't include seam allowances; so, you have to add your own, and they didn't even say you needed a zipper in the materials section (it just appears later in the instructions).